← The Secret Origin of Red Tool! Batman and Catwoman are getting married! Batman proposed in the latest issue of his solo series, and even though I don’t think Catwoman has given him an answer yet, I hope they go all-out with the superhero wedding. I want Nightwing as the best man, the Robins as the groomsmen, Harley and Ivy as the bridesmaids and Ace the Bathound as the ring bearer. I want the seats filled with Justice Leaguers and Outsiders! Who doesn’t love a superhero wedding? There have been tons upon tons of superhero relationships over the years. Once upon a time, they were the bread and butter of superhero comics. Clark Kent and Lois Lane are the standard bearer. Everybody knows about them! But what about marriage? How often do these classic superheroes actually tie the knot with their live interests? Lois and Clark did it. Who else? Join me after the jump to celebrate with my six favorite comic book marriages! No third movie for you! Younger me was really, really into the sanctity of comic book marriage. I never liked Wolverine, and I especially didn’t like the idea that Wolverine was always trying to steal Jean Grey away from Scott Summers. Scott and Jean were a classic comic book couple that I really liked, not least of all because Cyclops was a huge, glasses-wearing dork. I could relate. 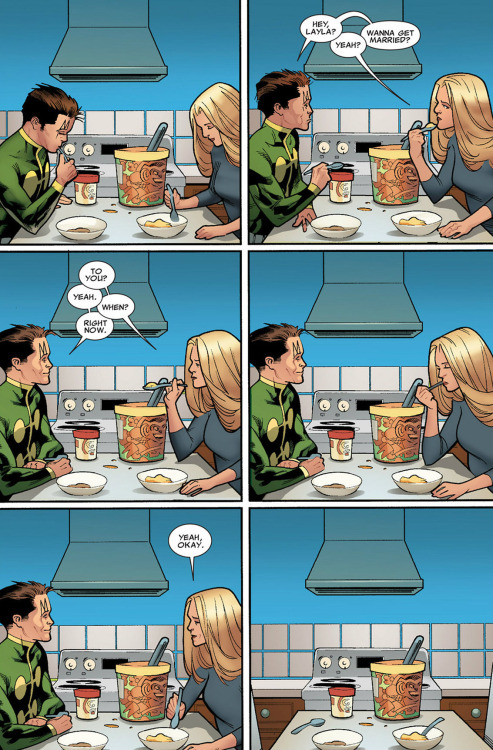 I don’t really have any investment in the two of them now that I’m an older comics fan (and I kind of like Scott and Emma Frost better), but I liked the strength and consistency of Scott and Jean in my youth. 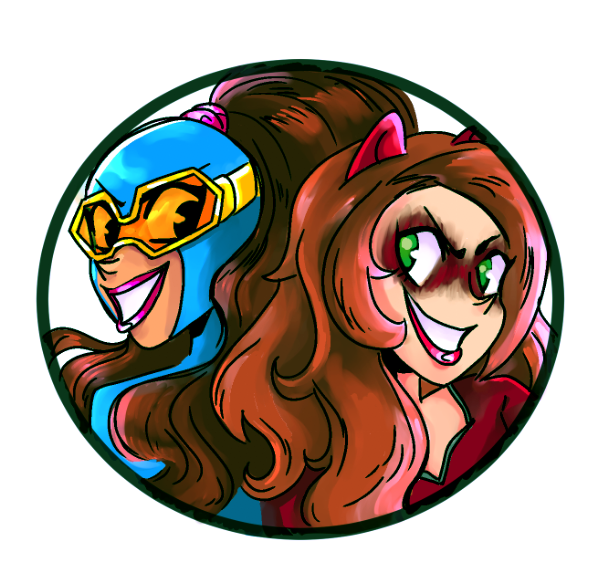 My favorite superhero got married! And it’s super weird! Jamie Madrox married Layla Miller in the pages of X-Factor. He first met her when she was a little girl and he was an adult man, so it’s super weird — but in that special comic book way. Layla knew the future, and she knew that she would married Madrox, so she teased him about it when she was a creepy little kid. Then, through the magic of time travel, Layla left the present, spent half her life in the future, and came back to the present as a grown adult. From Jamie’s perspective, she aged from a child to an adult in a matter of months. But to Layla, she lived a normal, ordinary life, and just happened to time travel back to the past as an adult. Comics, amiright? She and Jamie then spent a lot of time together until he was used to the idea that she was an adult now, then they got hitched and settled down on his family farm into a nice comic book retirement. So of course Madrox was brought back a couple years later just to be killed, with no Layla in sight. Marriage! I like Aquaman. And I like the idea that he’s totally found the love of his life, and that she’s another badass water-warrior. Unlike the superheroes that find ordinary people love interests, Aquaman got together with a fellow water-dweller. Mera’s got some complicated Atlantean origin, with her own set of powers, but she’s still a really cool person who fits nicely into Aquaman’s world. 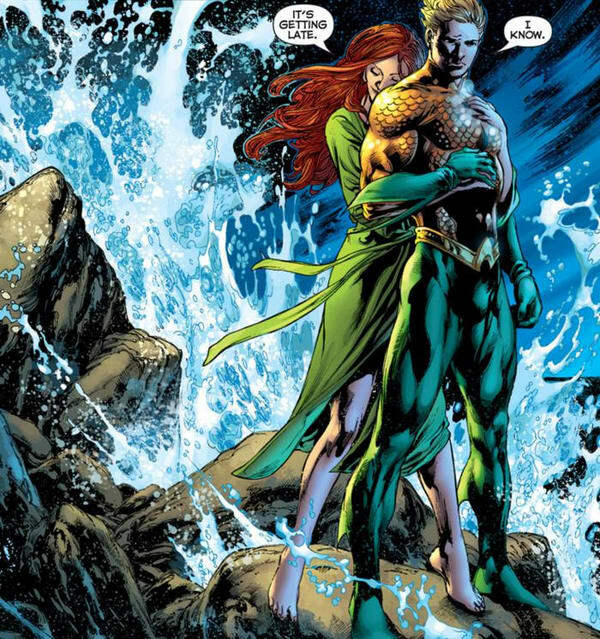 They were great together when Geoff Johns wrote the Aquaman comic in the New 52, and I think they’re still together, right? I gotta start reading Aquaman again. I don’t particularly like the New Gods. I don’t care about them. I don’t want to read about them. I don’t follow any of their comics. I don’t even particularly care about Darkseid, even though he’s a great Justice League boss. 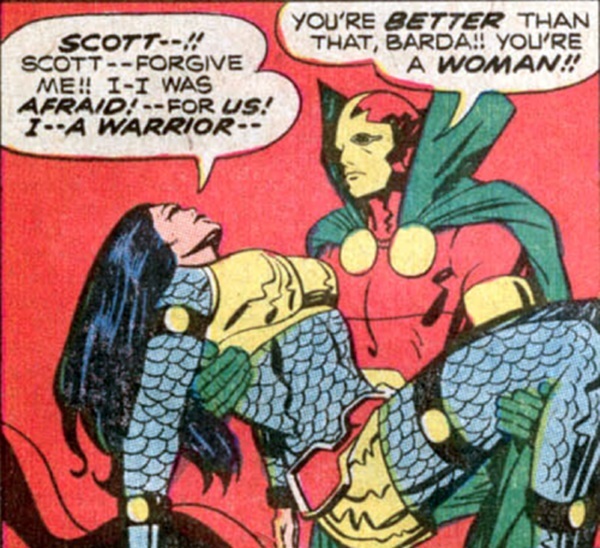 But I don’t really care about Big Barda or Scott Free…but I totally dig them as a couple! I really like the idea that an evil alien woman from one planet falls in love with the good alien dude from another planet, being held prison on the evil planet. And that they then come to Earth, get married and live a normal, domestic life in a nice town, occasionally helping out the Justice League. It’s sweet. 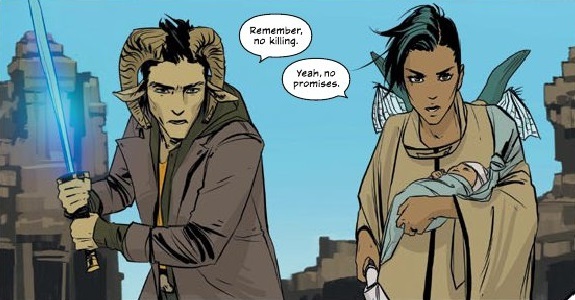 Without a doubt, my favorite married couple in comics today is Alana and Marko, the stars of Saga! Their relationship, their marriage, is the bedrock of that already amazing comic series, and the two of them together (with their daughter Hazel) make Saga something truly special. Their love for each other and their history together is unlike anything we’ve ever seen in a comic book romance. It’s messy, it’s weird, it’s sappy and it’s real; it’s absolutely perfect Add in the fact that they’re from two different species falling for each other in the middle of a giant war between those species, and that’s just icing on the cake that is their relationship. Plus Hazel is just adorable. 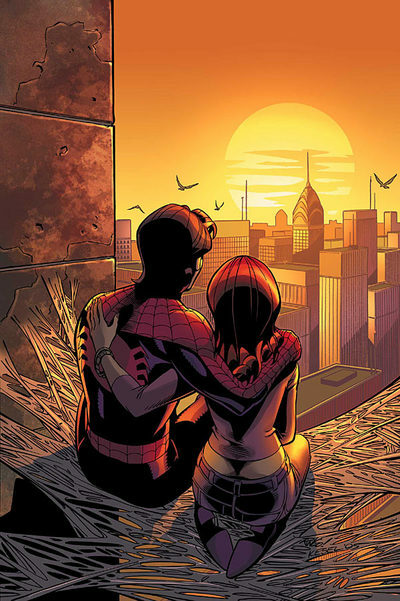 Count me among the comic fans who was perfectly content with the long-standing marriage of Peter Parker and Mary Jane Watson. I wasn’t around in the 70s when Peter and Gwen Stacy were a thing. I wasn’t around when Mary Jane really came into his life after Gwen died. I wasn’t even reading comics when they got married! But Peter and Mary Jane were a strong, entertaining couple when I arrived in Spider-Man comics in the 90s, and that was perfectly fine with me. I don’t think it made Peter Parker old and unrelatable. Lots of young people juggle marriage. It made Peter more relatable! And it was nice that he had someone who would always have his back. They were great together, and it’s still a sad shame that Marvel broke their universe to break them up. Peter hasn’t had a really good relationship or love interest since, to say nothing of Mary Jane, who was either written out entirely or shuffled off to be a tertiary supporting character in an Iron Man comic, of all things. Posted on June 14, 2017, in Comics, DC, Lists of Six!, Marvel, Multiple Man, Spider-Man, X-Men and tagged Image Comics, Saga. Bookmark the permalink. Leave a comment.